A companion to the book "The Art of Emotional Healing"
You Helped Make This Dream Come True! Created and released as an accompaniment to Dr. Lucia Capacchione's book, released in 2001. "Living With Feeling: The Art of Emotional Expression," this 5-CD set and sampler, provides the musical equivalent of nine familiar emotions: anger, playfulness, fear, love, confusion, peace, depression, happiness. These are all Cooper originals, with about 25% of the material written especially for this set. He has surrounded himself with a veritable who's who of current musicians, and can be heard himself on each and every track. Long-time associate, Tim Ponzek is musical director, arranger and lead keyboardist. In addition to the complete set, a musical sampler is also available. 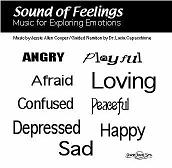 The Sound of Feelings: Music for Exploring Emotions was created by Jessie Allen Cooper as an audio sound track for Dr. Lucia Capacchione's book, Living with Feeling: The Art of Emotional Expression... A dynamic performer and recording artist, his earlier albums include Soft Wave ( Narada Productions ), Heaven Sent, and Moment In Time. Jessie wears many hats (usually berets) for he is also a visual arist and master framer. In Los Angeles gallery circles he is known as "framer to the art stars." These two multi-faceted artists met in the mid-80s when Jessie mounted a one-woman show of Lucia's photographs. Their friendship grew and so did their dream of collaborating on a project that would bring all the arts togeather in an audio program. The Sound of Feelings is that dream come true. It is the perfect complement to Lucia's earlier books. Author and pioneer in Expressive Arts Therapy, Lucia conducts workshops world-wide and has published twelve books, including the best seller, Recovery of Your Inner Child. The collaboration between these two talents is an exciting blend of Jessie's music and Lucia's Expressive Arts Therapy techniques. This ten-part program features nine families of emotions; Sad, Angry, Playful, Afraid, Loving, Depressed, Happy, Confused and Peaceful. First, listen to the The Sound of Feelings Introduction: Guided Narration. Do the simple drawing-to-music activities for expressing each of the nine families of emotions. Then listen to the guidelines for using the nine musical medley segments that serve as a "sound track" for exploring emotions through movement, music, drawing, painting, sculpting with clay, and creative writing. Living with Feeling: The Art of Emotional Expression (Tarcher/Putnam).